I suppose I asked for it. Trader Joe’s heard me whining about its rigid rules for seasonal goods and got rid of the cranberry apple butter. March 26, and it’s gone again, until fall. How I’ll manage to enjoy this entire glorious summer season without jarred cran-apple butter, I don’t know. If anyone has any suggestions, I’m all ears. to make the cake: Preheat the oven to 350°. Grease a 9-inch baking pan. Combine dry ingredients and set aside. Beat butter with brown sugar and vanilla until fluffy, about 3 minutes. Beat in eggs, one at a time. Gradually beat in pearsauce. Gradually beat in dry ingredients. The mixture should be a bit lumpy, but it looks great when it comes out of the oven. Bake at 350° for 35 to 40 minutes. Set aside to cool completely. to make the frosting: Melt the butter and let it cool. Combine cheese, butter, vanilla, and brown sugar; beat well with an electric mixer just until light and fluffy. 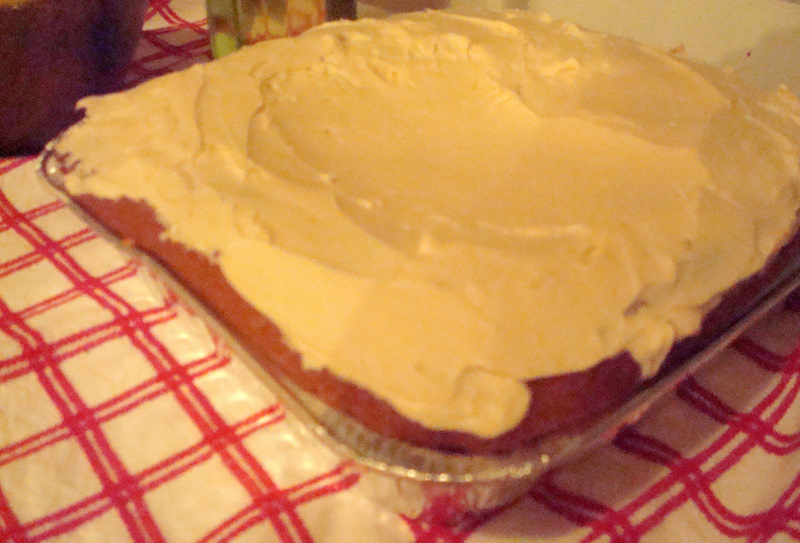 Once cake is cooled, spread the frosting with a flat spatula, and chill until devouring time. *This is enough frosting for the top of the cake. If you want to invert it and frost the sides as well, you might want to double the frosting recipe. tip: Let the cake cool substantially, and then stick it in the freezer for about 10 minutes before you frost it. It’s a moist cake, so the chill will make things easier and less crumbly while you work.